I was originally scheduled to fly home yesterday, but was forced to extend my stay by unfortunate chain of events that (among other things) has resulted with me swearing off contact lenses for the foreseeable future. If I worked with arabidopsis or brachypodium, I’d probably have plants flowering this week that I’d be missing. Without the chance to make the crosses I needed to continue my research I might be set back a month or more while I waiting for new plants to grow. If I was mostly doing wet lab work, I wouldn’t fall as far behind assuming I’d gotten all my projects properly refrigerated or frozen before leaving for Thanksgiving, but the whole week I was gone would still be a complete loss. Fortunately, I now study comparative genomics, which means, while I won’t get as much done this week as I normally would have, I’m definitely going to continue working. 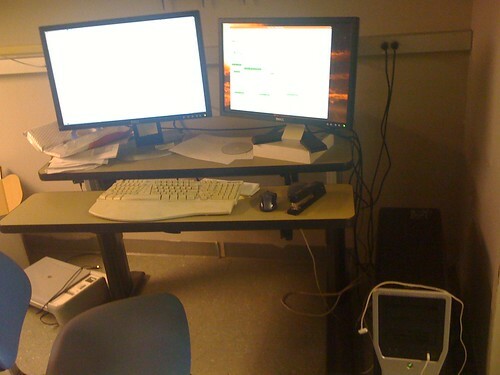 I’ve already shown off my workstation in the lab. 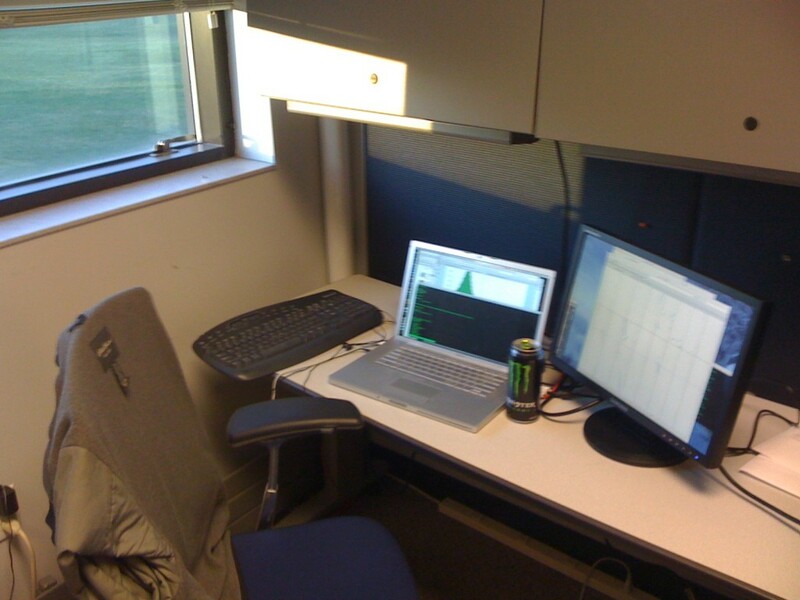 And here is where I’ll be working most of this week. I’ve been advised, by people who’ve been doing a lot longer than I have, that working on a laptop long-term is a great way to burn out your hands (carpel tunnel), but for a week it’s no big deal. I can get more work done from here, thousands of miles away, than from an apartment a few blocked from the job, because the faster internet connection means I’m better able to access my own workstation (the first computer pictured), two of the my lab’s servers, and even a Linux box I left running in my apartment, all of which was using for different parts on my work on Monday. If you look closely you’ll also notice one other difference between the permanent and temporary digs. Just for this week, I have a window! Posted in: Computers and Coding, research stories.